You are here: Home / General Crafts / Bath and Beauty / You’ll Love These Jasmine and Rose Sugar Scrub Cubes! 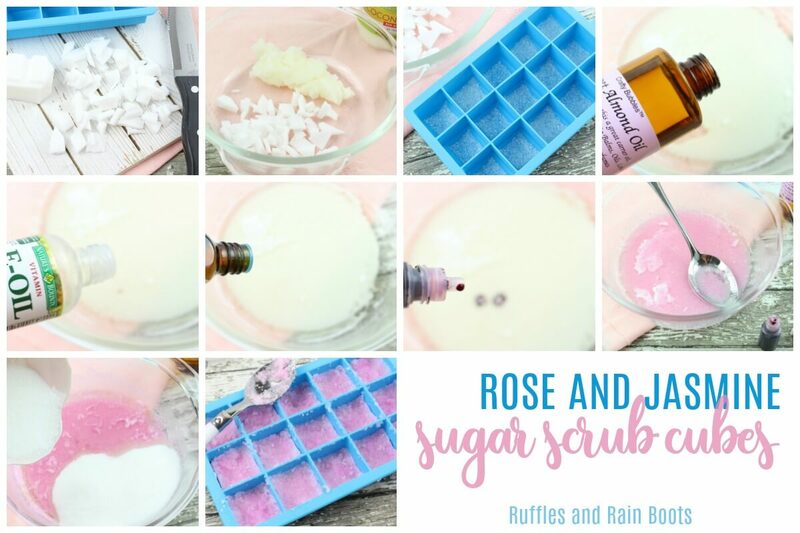 You’ll Love These Jasmine and Rose Sugar Scrub Cubes! 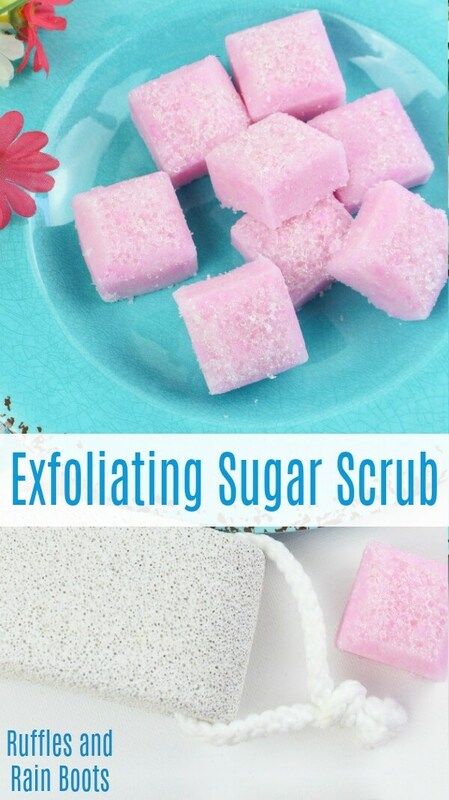 We made this rose sugar scrub into a solid to get ALL the benefits of a great exfoliation without the mess. It makes gift-giving a snap, too! 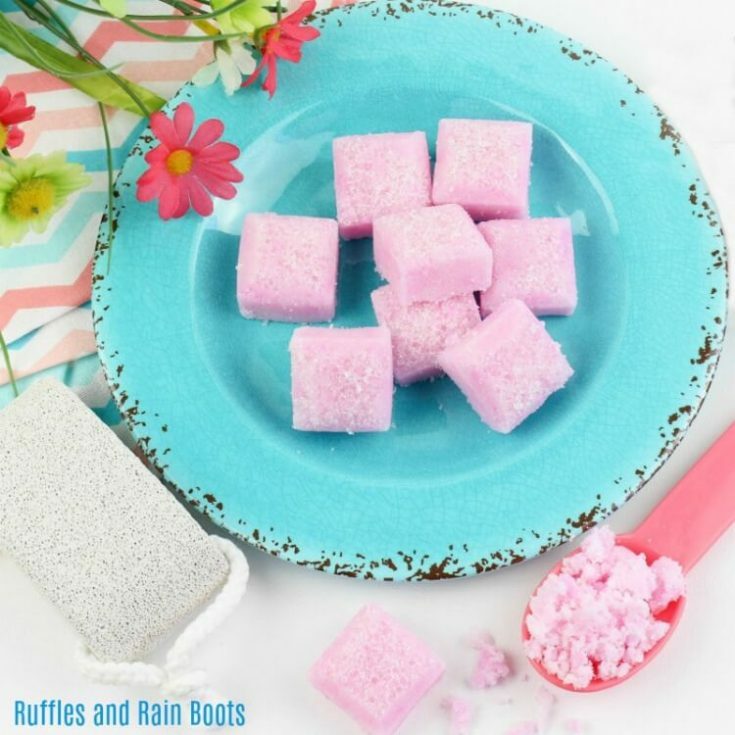 It’s no secret we love making our own bath bombs and bath products here at Ruffles and Rain Boots. Because my daughter and I are both sensitive to some of the chemicals, colorants, and preservatives used in over-the-counter products, we have no choice. That said, it’s ridiculously easy to make homemade bath products. 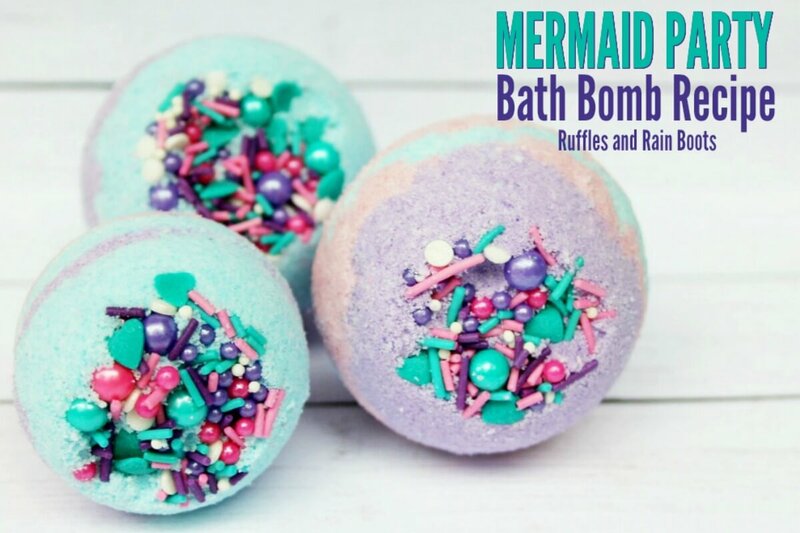 One of our favorite bath products here on Ruffles and Rain Boots are these Mermaid Bath Bombs. They are so much fun to make, give, and use! Add the shredded shea butter and coconut oil into a microwave-safe bowl. Zap on high in 30-second intervals until melted. Mix in the vitamin E oil and essential oils. Add the pink soap colorant. Note: the white sugar will lighten the mix, so color more deeply for a more intense hue. Add in the sugar and stir quickly until incorporated. 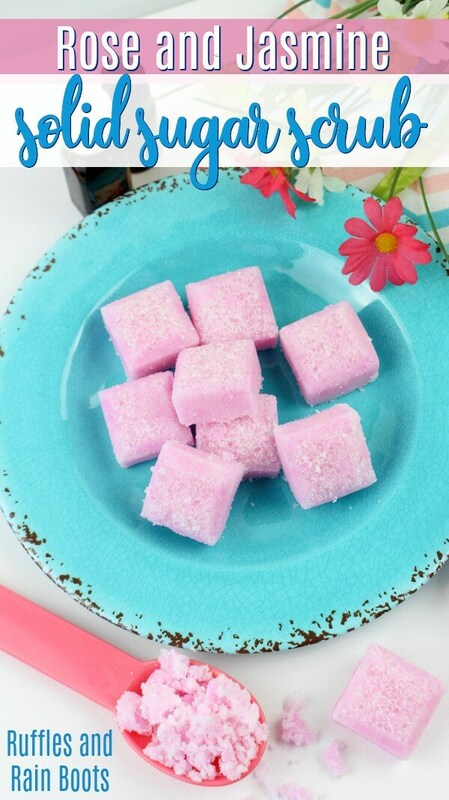 Sprinkle sugar into the bottom of each cube in the mold. Add the mix to the mold and press firmly. Chill for 2 hours in the refrigerator. Store the jasmine and rose sugar scrub cubes in an airtight container. 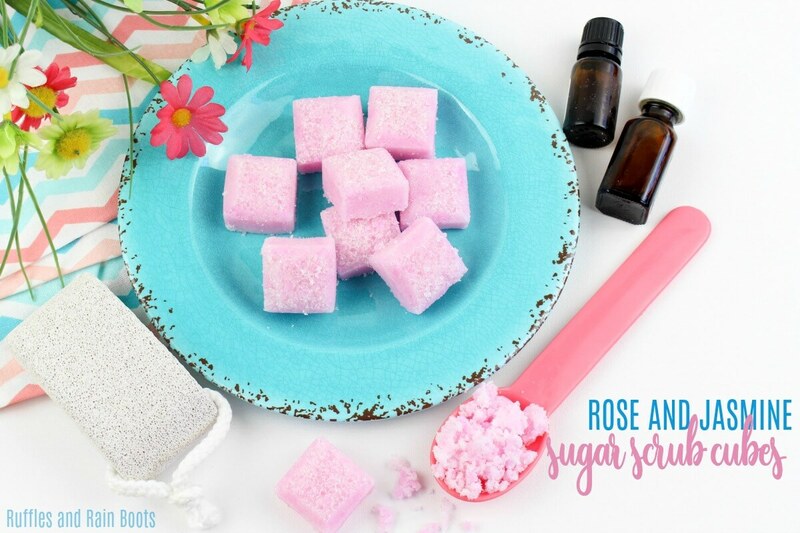 You'll Love These Jasmine and Rose Sugar Scrub Cubes! As long as you don't change the oil I used in the recipe, they should last at least 6 months with no change to scent or texture when stored in a completely airtight container. A general rule of thumb is that a non-water-based sugar scrubhas a shelf life of the carrier oil used. For example, if you were to use hazelnut oil the scrub would only last 3 months maximum. And just in case anyone has this question: Even though I added vitamin E oil as an anti-oxidant and it will help to reduce the oxidation of the oil, it isn't a preservative. The benefits of using it are for the skin. I never knew I liked the smell of jasmine until I tried this recipe. The flower scent seems so strong until it’s mixed with something. What is your favorite scent for bath products?